Mr Abbott has revealed he failed to make a key vote in 2009, while a shadow minister, after drinking too much wine the night before. Rumours had swirled over why Mr Abbott missed the vote on a stimulus bill during the global financial crisis. Mr Turnbull, then opposition leader, described the incident as unacceptable. "There was nothing we could do," Mr Turnbull told radio station 3AW on Friday. "As Tony acknowledged, the whips [fellow MPs] tried to rouse him to get him down into the chamber to vote, but they were unable to move him." 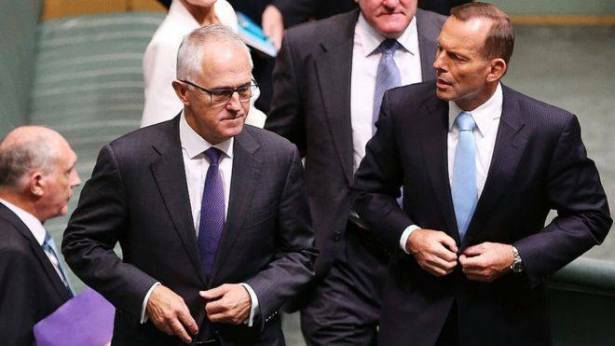 Mr Turnbull said Mr Abbott's absence was "not acceptable or admirable in any way" and the vote had been important. "I was disappointed. I cannot remember anyone else missing a vote because they were too drunk to get into the chamber, but the fact is that Tony has 'fessed up to it, he knows it was an error or whatever," Mr Turnbull said. Mr Abbott toppled Mr Turnbull for the Liberal Party leadership later in 2009, only for Mr Turnbull to reclaim it in 2015, when Mr Abbott was prime minister. Mr Abbott remains a vocal critic of the government and is opposed to gay marriage, a position which has put him at odds with the prime minister. Mr Abbott only revealed the truth behind his absence in an upcoming episode of a television series about parliamentary life. In an excerpt released on Friday, Mr Abbott admitted he and two party colleagues had consumed "quite a few bottles of wine". "I think all of us were in a mellow and reflective mood so the reflections went on for longer and later than they should have, and the impact was rather greater than it should have been," Mr Abbott told the Australian Broadcasting Corp.
"I lay down and next thing I knew it was morning." It meant Mr Abbott did not vote on an economic stimulus bill, which was part of Australia's response to the global financial crisis. Wayne Swan, who was government treasurer in 2009, criticised Mr Abbott following his disclosure. "Of course, now we know the truth - he slept through some of the most important votes in the Australian parliament in over 50 or 60 years," he said on Friday.